Are you concern about security of your home or office? And looking for a security lighting solution? 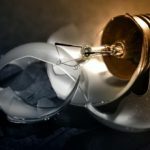 Look no further than solar powered security lights – remember a good light is one that performs well on any given condition, and is robust and affordable. 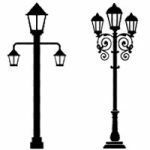 With the advancement in solar technology there have been many types of security lights available in the market – the one we are discussing here are the solar motion detection security lights. These portable solar security lights can be fixed on the shed, behind your backyard garage, outdoor wall, above the deck, or on the pathway of your backyard. 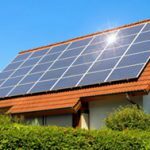 Due to the fact that solar lights generally don’t need wiring, it’s easier to install them anywhere and you can even move them easily without needing any expert or consultant to contact and spend money on, even a naive person can do it. Solar security lights are available in a wide spectrum of designs, material and brands. There are so many products with various features to choose from, it’s get very difficult to pick the best solar security light for your particular needs. 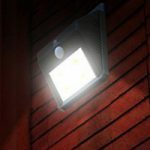 To help you choose the best solar motion sensor security light we’ve hand pick a list of 5 solar security light and put up a brief review of each item based on features, price and customer reviews. 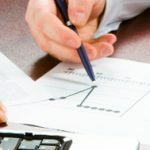 Read a particular review and decide and buy the one which is best suited for your requirements. Do you want to give a shocking experience to strangers trying to enter your home? 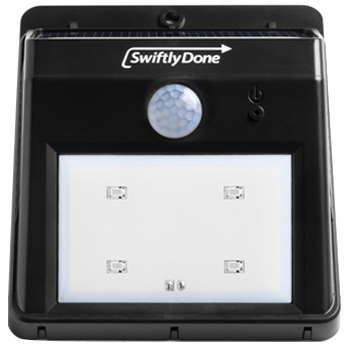 Swiftly Done solar security lights with motion sensor may be the answer to those people. 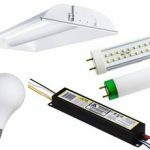 This light requires no wiring, runs on solar power and offers an impressive 10 feet with 120 degree angle motion detection. It stays turned off during day time, shed very soft white light on the regular setting and shines very bright (for 10 seconds) when detect any motion within its range – It’s all automatic. 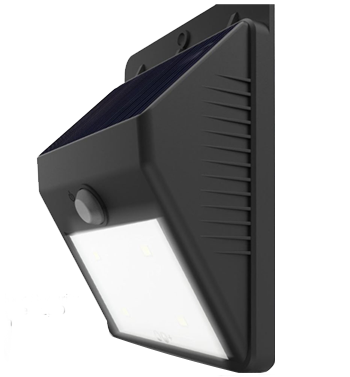 Suitable for garages, decks, and front doors, the security light comes in black color weather-resistant & heatproof plastic construction – the peel and stick mounting is strong and is what make SwiftlyDone solar security light apart from the rest. It will compliment your home’s aesthetics instead of detraction. This small but brighter solar security light from LAMPAT is also a peel and stick light that can be stick to almost any kind of surface i.e. wall plaster, bricks, wood, metal, glass etc. It provides much needed illumination to your outdoor garden. This is a recommended product for those considering solar powered security lights for night safety and security of their house, its inexpensive and powerful motion sensor light. It’s LED produces powerful 80 Lumens, that’s waterproof, heatproof, and made of high impact plastic, impressive durable and super bright light. The motion sensors are powerful it can detect movement at around 12 to 15 feet within an angle of 120 degrees, it turns ON when it detects motion (for 30 seconds) and turns OFF automatically. You can install it anywhere, however i have used it and is a perfect fit over to your front door. 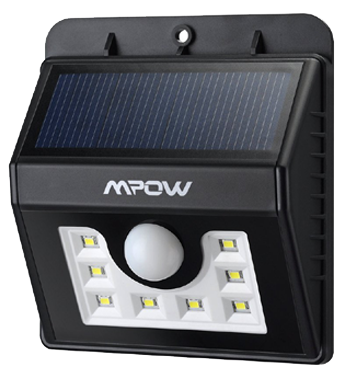 Mpow Solar Powered Wireless Security light is a durable weatherproof plastic with 3 sensor mode and enhanced solar panel. The unit comes with screw & wall plugs you can either hang it or mount on wall the light is small it can easily fit in your hand palm meaning it can be secretly positioned without looking out of place. The sensor is powerful and even a small movements in nature effortlessly activate it — the detector pick up on nearly any movement, including that of birds, and even tree branches! There are 2 levels of lighting, high and low. There is a sliding button at the back of the unit to turn the light OFF or select different modes. It gives bright light for about 15 -20 seconds when it detects motion (120 degree radius, up to 26 feet) and settle back down to low brightness. 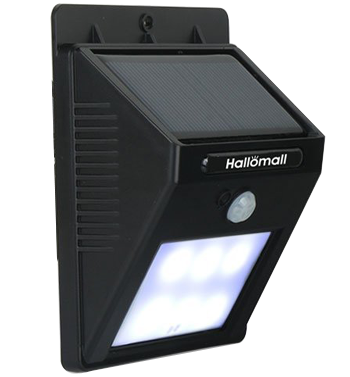 Solar security lights from Hallomall offer 6 Super-bright LEDs that are designed to provide great visibility in your backyard during night. The body made of durable, weather-resistant & heatproof plastic material works well in all season including winter. The lights easily work whole night (8-12 hours) once it gets a full charge. It gives a dim light while in rest mode and it shines nice bright light when activated by motion, its sensors are powerful enough to detect any motion from 10 feet (120 degree sensing angle). The light is small sized 4 inches – the fixing is easy with a single screw installation, it’s a great fit for your backyard where you don’t want a constant light, you need to have it only when you need it aka only shines when motion is detected. At motion sensing they give bright light for about 30-40 seconds, and then shut-off completely, no “dim” mode. 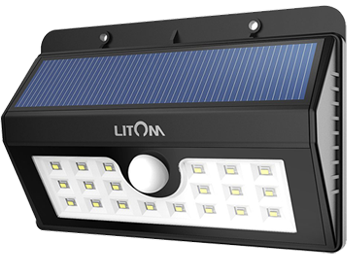 The Litom 20 LED is for those who need to illuminate a larger area, strongly built with two thick plastic and tightly-sealed sealing that holds up to moisture, can easily withstand against rain and snow without issues. Dazzling 440 lumens it’ll effortlessly brighten up a good sized backyard. There is a good quality solar panel absorbs sun-rays quickly and generates the power to run the light, there is a lithium ion cylindrical 3.7 v 2200 mAh replaceable battery inside the unit. The enhanced motion sensor of Litom is bigger and more powerful easily detects motion from a much longer distance of 10-20 feet. The light has 3 modes with the “off until motion is detected” mode. There are 2 holes so it can either be hung, or mount with two included head screws plus wall plugs.